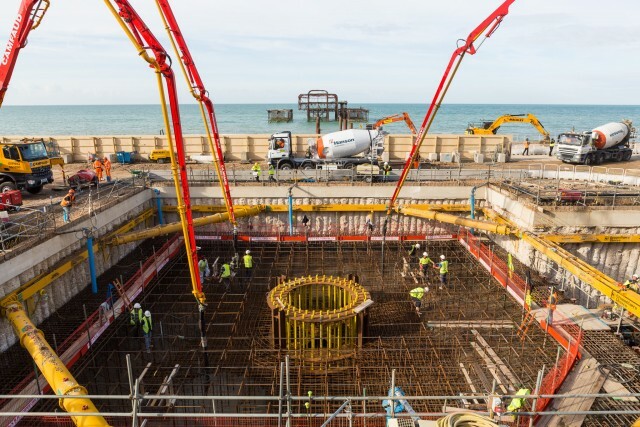 This weekend was the first phase of the Brighton i360 foundation pour. A total of 2500 tonnes of concrete was poured into the foundations over 12 hours starting at 6am on Saturday morning. On average a cement truck was coming on site every 5 minutes to one of 3 pumps. The pumps can put the concrete anywhere in the foundation. There was a small group of men for each pump using vibrators to remove air from the concrete and to make it level. I was on site taking pictures and I also shot a time-lapse of the pour. I’ve been working for the Brighton i360 for almost a year now. I’ve previously posted pictures from my visit to Cif in Holland where the tower is being made and I also posted posted the first 8 month of a time-lapse which is documenting the entire build. As part of an ongoing commission to document the construction of the Brighton i360 I’ve been shooting a long term time-lapse of it’s building site. I’ve set up a camera that has been taking a picture every 10 minutes, from the start in July 2014 to February 2015 it’s now shot over 25,000 images. The edit I’ve made excludes weekends, holidays and nights, although I’ve included three nights when they were working 24 hours a day to divert a sewer. 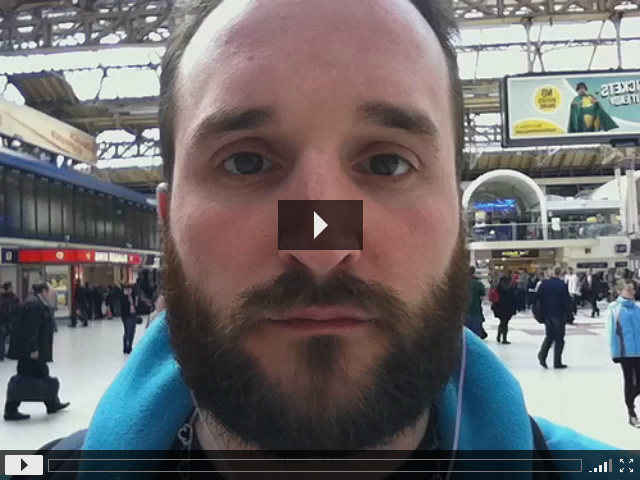 Just over a year ago I reviewed an app for the iPhone called Everyday. 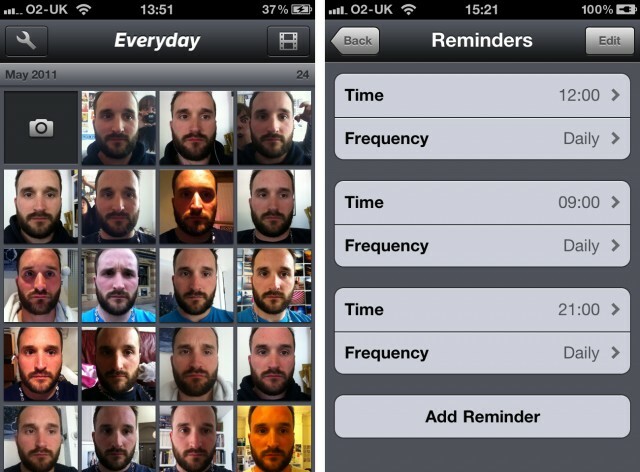 The premise is quite simple, it prompts you to take a photo of yourself every day or at an interval that you set. I get prompted 3 times a day, that way even if I miss one photo I would never miss a whole day. Below is the resulting movie, it’s made from 730 frames displayed at 10 frames a second, you see roughly 3 days every second. The sound track was specially crafted by Malcolm Goldie. Watch the beard grow! For the past 2 months I have been using a little iPhone application called Everyday. The app was inspired by photographer Noah Kalina, and I first heard about it after attending a talk by Noah. Noah is best known for taking a picture of himself everyday for the past 11 years. You can see the first 5 years of his project in this YouTube video, which has been viewed almost 20 million times. When you first start using Everyday there is not much to write home about, but after a while you will start to love it! 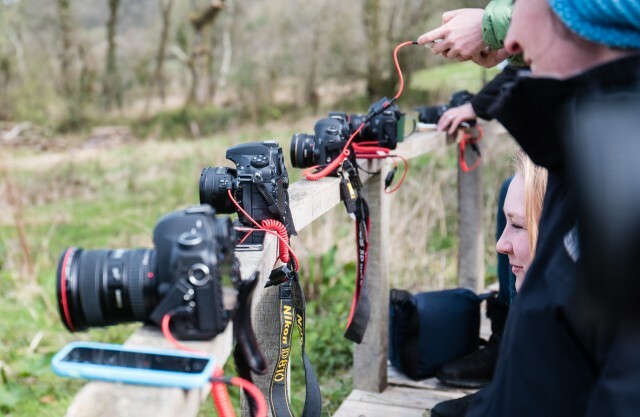 The premise is simple; take a photo of yourself at regular intervals. Once you have enough, you can make a time-lapse video of your self, creeping towards the grave. I have mine set to prompt me 3 times a day at 9AM, 12PM and 9PM. You can set it to prompt you as much or as little as you want.